Such was the case with Anne Barnard’s new reporting from inside west Aleppo, the major portion of the city which is in government hands and copes with regular terror rocket and mortar attacks from rebel-held east Aleppo where Al Qaeda militants and U.S.-armed-and-funded “moderate” rebels fight side-by-side. Almost in passing, Barnard’s article on Sunday acknowledged the rarely admitted reality of the Al Qaeda/”moderate” rebel collaboration, which puts the United States into a de facto alliance with Al Qaeda terrorists and their jihadist allies, fighting under banners such as Nusra Front (recently renamed Syria Conquest Front) and Ahrar al-Sham. Barnard also finally puts the blame for preventing civilians in east Aleppo from escaping the fighting on a rebel policy of keeping them in harm’s way rather than letting them transit through “humanitarian corridors” to safety. Some of her earlier pro-rebel accounts suggested that it wasn’t clear who was stopping movement of civilians through those corridors. Granted, you still have to read between the lines, but at least there is the acknowledgement that rebels are refusing civilian evacuations under the current conditions. How that is different from Islamic State terrorists in Mosul, Iraq, preventing departures from their areas – a practice which the Times and other U.S. outlets condemn as using women and children as “human shields” – isn’t addressed. But Barnard’s crimped admission is at least a start. Again, that isn’t the clearest description of the situation, which is stunning enough that one might have expected it in the lede rather than buried deep inside the story, but it is significant that the Times is recognizing that Al Qaeda and the U.S.-backed “moderates” are “working together” and that Russia opposes that collaboration. While she then throws in a caveat about the impossibility of verifying the numbers, the acknowledgement that the U.S.-backed “moderate” rebels and their Al Qaeda comrades have been shelling civilians in west Aleppo is significant, too. Before this, all the American people heard was the other side, from rebel-held east Aleppo, about the human suffering there, often conveyed by “activists” with video cameras who have depicted the conflict as simply the willful killing of children by the evil Syrian government and the even more evil Russians. Though the human toll in both sides of Aleppo is tragic, we have seen comparable situations before – in which the U.S. government has supported, supplied and encouraged governments to mount fierce offensives to silence rockets or mortars fired by rebels toward civilian areas. In the context of those deaths, U.S. Ambassador to the United Nations Samantha Power, who has built her career as a supposed humanitarian advocating a “responsibility to protect” civilians, laid the blame not on the Israeli military but on fighters in Gaza who had fired rockets that rarely hit anything besides sand. 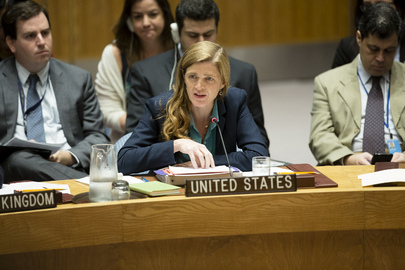 Perhaps it’s expected that the U.S. government, like other governments, will engage in hypocrisy regarding affairs of state: one set of rules for U.S. allies and another for countries marked for U.S. “regime change.” Statements by supposed “humanitarians” – such as Samantha Power, “Ms. R2P” – are no exception. But double standards are even more distasteful when they come from allegedly “objective” journalists such as those who work at The New York Times, The Washington Post and other prestige American news outlets. When they take the “U.S. side” in a dispute and become crude propagandists, they encourage the kind of misguided “group thinks” that led to the criminal Iraq War and other disastrous “regime change” projects over the past two decades. Yet, that is what we normally see. A thoughtful reader can’t peruse the international reporting of the U.S. mainstream media without realizing that it is corrupted by propaganda from both government officials and from U.S.-funded operations, often disguised as “human rights activists” or “citizen journalists” whose supposed independence makes their “propo” even more effective. So, it’s worth noting those rare occasions when The New York Times and the rest of the MSM let some of the reality peek through. When evaluating the latest plans from Hillary Clinton and other interventionists to expand the U.S. military intervention in Syria – via prettily named “safe zones” and “no-fly zones” – the American people should realize that they are being asked to come to the aid of Al Qaeda.